Lissa took on the role of Hospital Manger in May 2018. Lissa grew up in a small town outside of Athens, GA. She has loved animals for as long as she can remember and started volunteering at local shelters and pet sitting at an early age. She has experience in the veterinary field since 2008 and now has her CVA. 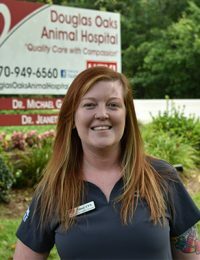 Although Lissa loves and enjoys working with all animals, she has a special place in her heart for our furry feline friends. In her free time, Lissa enjoys playing ping pong with her husband Ryan, and snuggling with her two cats, Foxy Lady and Biggie Smalls.